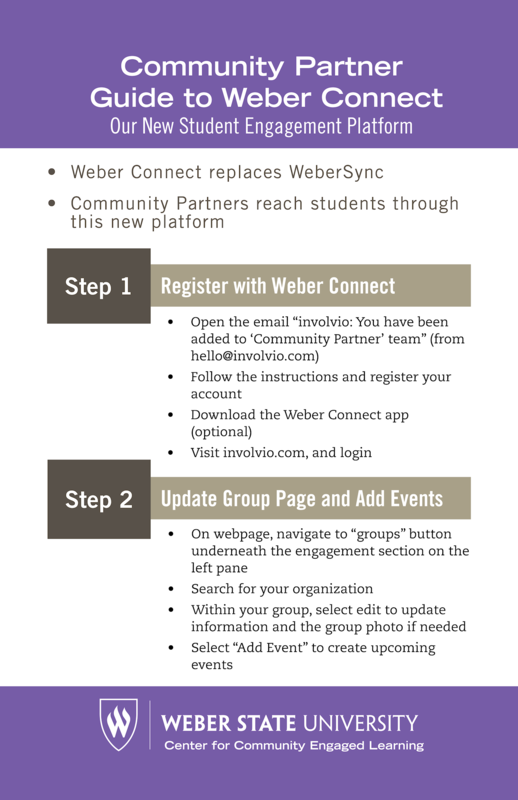 The Center for Community Engaged Learning has officially transitioned to a paperless, tracking system called, Weber Connect. This system can perform a variety of functions that will benefit students, faculty and community partners. One of Weber Connect’s benefits will be the digital tracking of community engagement. It will also be utilized as a streamlined location for advertising volunteer opportunities. Download the Weber Connect app to your phone today! Provides the university with a more accurate picture of the community engagement happening on our campus. It is the official hours tracking system for staff participating in the Service Leave Policy (PPM 3-66) wherein staff can be granted up to 8 hours leave to participate in voluntary service to the community through the following CCEL sponsored days of service: WSU’s Day of Remembrance, WSU Honors MLK Week, and WSU Makes a Difference in Ogden. Helps you keep track of all of your community engagement in one place for resume building and other purposes. You can access your community engagement record online at any time from anywhere.